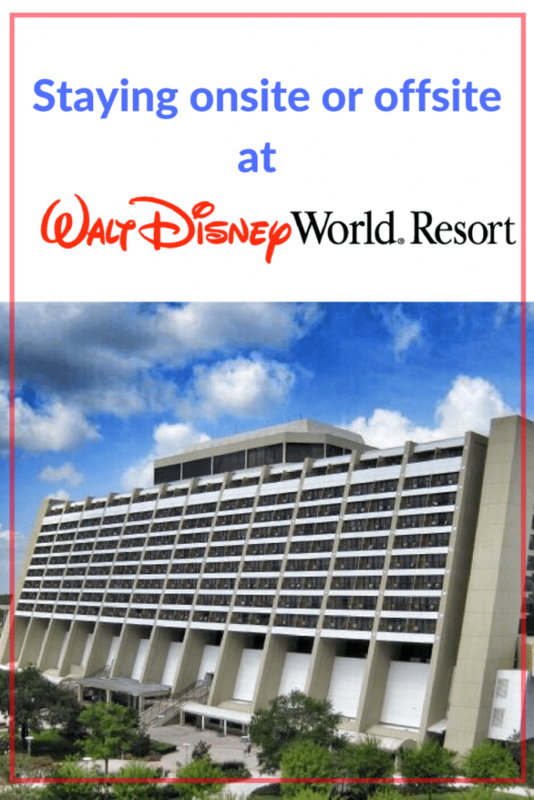 Onsite or offsite at Walt Disney World; where should you stay? If you’re coming to Walt Disney World, one of the first questions you’ll have to ask yourself is, do I want to stay onsite or offsite at Walt Disney World? We’ve stayed onsite in a variety of Disney resorts, as well as staying offsite in both hotels and time share properties, so I know a little bit about what both will involve. There are benefits to both options, and knowing the pros and cons to each choice can help you to make an informed decision that will be right for your family. So let’s take a look and figure out which one will be best for you! Location location location – obviously one of the best, and most obvious, reasons to stay onsite at Walt Disney World is the location. There is nothing like being encased in the Disney bubble 24/7; you truly can forget about the outside world and concentrate on your vacation and spending time with your family. The Disney resorts are all incredibly well-themed, with immaculate attention to detail. If you’re traveling with kids, they will go nuts for all of the Disney details; from the over-sized character figurines at the All-Star Resorts, to the Lion King-style savannah at Disney’s Animal Kingdom Resort (complete with free-roaming giraffes, zebra, and wildebeest! ), Disney is all around you. FastPass+ – if you haven’t been to Walt Disney World in the last few years, you might not be familiar with the new FastPass+ system. If this is all new to you, I would highly recommend checking out this post at It’s a Disney World After All to get you through the basics. If you’re more familiar with the system, then you’ll know that a huge perk to staying onsite at a Walt Disney World resort is getting to book your FastPass+ reservations ahead of everybody else; 60 days from your check-in date. This makes a huge difference when you’re looking to book for the headline rides, such as Frozen Ever After at Epcot, or the Seven Dwarves Mine Train at Magic Kingdom. Once FastPass+ reservations open up for other guests at 30 days out, many of those FastPass+ slots are only available at inconvenient times – if they’re available at all! I would easily say that this is the biggest perk to staying onsite if you there are attractions you absolutely must-do, especially if traveling with little ones. Extra Magic Hours (EMH) – Extra Magic Hours, or EMH, refer to times that the Walt Disney World parks are only open to resort guests. There are EMH every single day, either before the parks open, or after they close, and they vary from park to park each day. These EMH are gold; you wouldn’t believe the difference they make in getting as many rides done as possible. For example, if Magic Kingdom opens to the public at 9am, EMH might start as early as 7am. If you are able to get up and out – I know, easier said than done! – that early, you will be able to ride a huge number of popular attractions with little to no wait before anyone else even enters the parks. This is also super helpful if there’s a FastPass+ that you might have missed; you can go to this attraction during EMH and ride with a much shorter line than you would if you tried during the day. If you’re traveling with kids, especially young kids, chances are you’ll be up early anyway, so you might as well take advantage of these! EMH also go on after the parks close, and if you have older kids, or kids who are able to stay up later, this can be a really fun new way to see the parks in a whole new way. Convenience – staying at a Walt Disney World resort is about as convenient as it gets. There is complimentary transportation from each of the parks to each of the resorts; buses, boats, and monorails run as long as the parks are open, and are a quick and easy way to get back to your room. If you stay offsite, you will have to drive or take a cab onto property, and this can be time consuming; Walt Disney World is a pretty big place! You will also have to pay to park, and then walk or take a tram from your car to the front of the park. All of this takes extra time, and while it might not be a big deal in the mornings when everyone is excited, it makes a huge difference at the end of the night when both kids and adults might be exhausted. Staying onsite is also ideal if you have little kids, and plan on taking a break during the middle of the day to go back to your hotel room. If you’re visiting during the summer months (which really go from about May to September!) then temperatures can get into the triple digits during the middle of the day; taking a break to go back to the resort to swim or take a nap is a great idea, and this is much easier if your hotel is close by. The Disney Dining Plan – I will be completely honest: I am not a fan of the Disney Dining Plan. Having said that, some families swear by it, and it is something that is only available to guests staying onsite. The Disney Dining Plan is a prepaid meal plan, where you pay a certain amount of money per person per day, and this will include many of your meals and snacks. For my family, it doesn’t seem to be beneficial cost-wise, but if your kids are big eaters, or you want to eat at the character buffets, the plan can really work for you. To learn more about the Disney Dining Plan, take a look at this post by WDW Pro. Price – as previously mentioned, Disney resorts can be expensive. Even though Disney does offer discounts throughout the year, the prices are still high for what you get. A value resort, while extremely well-themed and maintained, is basically a motel-style propety, and yet you pay an awful lot more just because it is onsite. For the same price, you can get a room at a 4-star resort offsite, and any money you save can be spent on meals, souvenirs, or other activities. Staying on Disney property also encourages you to spend money onsite, and Disney prices for everything from food to amenities can be overpriced. Staying offsite allows you greater access to food options, another way to save money. Space – the majority of rooms at Disney are regular hotel rooms, and they are on the small side. If you’re used to traveling with kids, you’ll know just how much stuff you have to bring, and it can definitely start to feel cramped after a few days! Disney does offer villa properties, and this can be a great option if you have a large family, but they do come at a cost. One of the great options in staying offsite is renting a house or condo close to property; you get so much more space, including a full kitchen, meaning you can save money cooking some meals instead of eating out. This was an option that my family explored, and we really enjoyed it. We have a picky eater, and having the chance to make him food in the kitchen, instead of trying to find somewhere he was willing to eat every morning as soon as he woke up, was wonderful. We also loved having the extra space, especially the seperate bedrooms. Again, this is an option Disney offers, but you can get the same thing offsite for a much smaller price tag. Freedom – staying onsite at Walt Disney World, particularly if you don’t have a car, means you are somewhat restricted in where you can go and what you can do. Of course, you can always get a cab somewhere, but I know that, when we’ve stayed onsite, we’ve always just ended up doing everything around property. We’ve eaten onsite, spent our evenings at the parks or at Disney Springs, and never really left property. For many families, this will be no problem, but others may find the restrictions irritating. Staying offsite, whether you have a car or not, provides more options for food and other things to do outside of Disney. Central Florida has some amazing restaurants, more theme parks than just Walt Disney World, and a huge variety of other attractions (check out this post on what to do in Orlando outside of the theme parks!) Having the freedom to go and go those things is a great benefit of staying offsite. If you’re still not sure whether staying onsite or offsite will work for your family, there may be a compromise that ticks some of each of the boxes. Within walking distance to Disney Springs is the Disney Springs Resort Area. This includes hotels from brands such as Hilton, Wyndham, and Holiday Inn, all on Disney property. The hotels here have offer some of the perks of staying at an onsite Disney Resort: you are still immersed in the Disney bubble, with the hotels offering Disney merchandise in their gift shops, as well as ticket and reservation options at the concierge. You also have a complimentary shuttle bus to get you to and from the parks, making it easy to take that mid-afternoon break. Best of all, a number of these hotels now allow guests with certain ticket packages to book FastPass+ reservations 60 days out, just as they would be able to do staying onsite!The hotels are generally cheaper than Disney resorts, saving you some money to spend on the amazing shops and restaurants a short walk away at Disney Springs. You will also have the freedom to walk another short distance in the opposite direction to visit Crossroads, a shopping village with a number of great food options as well as a grocery store. Leah over at Five for the Road stayed at the Lake Buena Vista Resort, a Disney Springs Resort property, this year and had a wonderful time; read this post from her about why she loved this hotel so much. For more information on Disney Springs resorts, check out this website. Where do you choose to stay when you visit Walt Disney World? Let me know in the comments! Onsite we like the Contemporary or the Animal Kingdom Lodge. Offsite we prefer the Residence Inn (if we want extra space) or for a treat, we love the JW Marriott! We love Animal Kingdom Lodge too, waking up to a giraffe outside the balcony is amazing! I’ve never stayed at the JW Marriott, but I’ve heard excellent things about it – I’ll have to give it a try one day!